So Canada is in the midst of an election, and we're chugging towards a May 2nd date with the end of the world as we know it, erm, ah, destiny. I live in our nation's capital region and as both a former journalist and bureaucrat in my former lives I probably follow politics a little more closely than most. I think anyone beyond the confines of our region half the time could care less, though. I'm being kind. It's probably more like 90% of the time. But the televised leadership debates will afford Canadians an opportunity to see our political bobble heads in action, away from the sterile and staged daily events and outside the prism of nightly televised attack ads. Almost. You see the television consortium responsible for this exercise in uncivil civics in action has, in it's wisdom, decided to omit Green Party leader Elizabeth May from the debates because she hasn't any sitting members of Parliament, even though she will be fielding candidates in every riding across the country, unlike Bloc separatist leader Gilles Duceppe who only fields candidates from the province of Quebec. I guess like that great 20th century philosopher Kermit the frog said, "It ain't easy being Green." That they gave me a political wedgie? When debate seems to be the hardest word. And I thought our political system was confusing? Let the woman speak! Boom Boom: Well her party's going to court over this so Elizabeth may speak yet. But for now Elizabeth May, not. Whoa. Is that female bobble head Elizabeth May? I'm gonna assume it is (and yes I know what happens when you assume...blah, blah, blah! hee hee). At first glance, Ms. May's bobblehead looked like SARAH PALIN! Perhaps therein lies the TRUE problem? Well, this was truly fun and well done. A roaster of the 'coaster'. "Boom Boom: Well her party's going to court over this so Elizabeth may speak yet. But for now Elizabeth May, not." I think you should run for Political PUNdit of the year. Quirks: Compared to Sarah Palin, for what Elizabeth May lacks in political donations she more than makes up for in political acumen (even though she's the only woman leader in the race, haha). 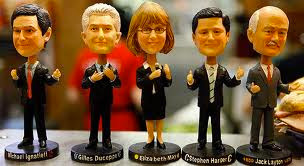 Meanwhile, how appropriate that bobble heads portray our politicians! Elizabeth really looks like Sarah Palin. And your lyrics are AWESOME!!!! meleah rebeccah: I'll have to run real pics of Sarah and Elizabeth. They don't look alike at all! Those bobble heads are deceiving. Ha! Not unlike our politicians! At least you're getting a chance to dump your cretin conservatives. We're stuck with ours and now a lot of the morons who thought it would be such a grand idea to vote them in are standing around with their thumbs up their arses going "Gee. I didn't know he'd do THAT!" Unfortunately, their buyer's remorse is a little late. I'm enjoying hearing about Canadian politics for a change. Haha... it's so funny to find people comparing Elizabeth May to Sarah Palin in looks ! I believe people should be left with there blissful ignorance. I believe it was Churchill who said " "Democracy is the worst form of government, except for all those other forms that have been tried"
Jayne: Our Conservatives are not that different than yours. The sad thing is, short of a miracle, it looks like the majority of Canadians will return them to power. Call me a hopeless romantic (or a liberal) but I believe in miracles. Jaffer: I know. They couldn't be more different. Tune in tomorrow where I'll perform a public service for my readers. I really hope Harper gets voted out. Nicky: I actually concur with excluding her from the debate, whether she'd make a contribution or not. And I'm not hard on Duceppe. I was only trying to find a rhyme for "word". (You've been following me on Facebook, I see.) And if Harper's re-elected, to paraphrase a Tory attack ad, he won't be coming back for me.